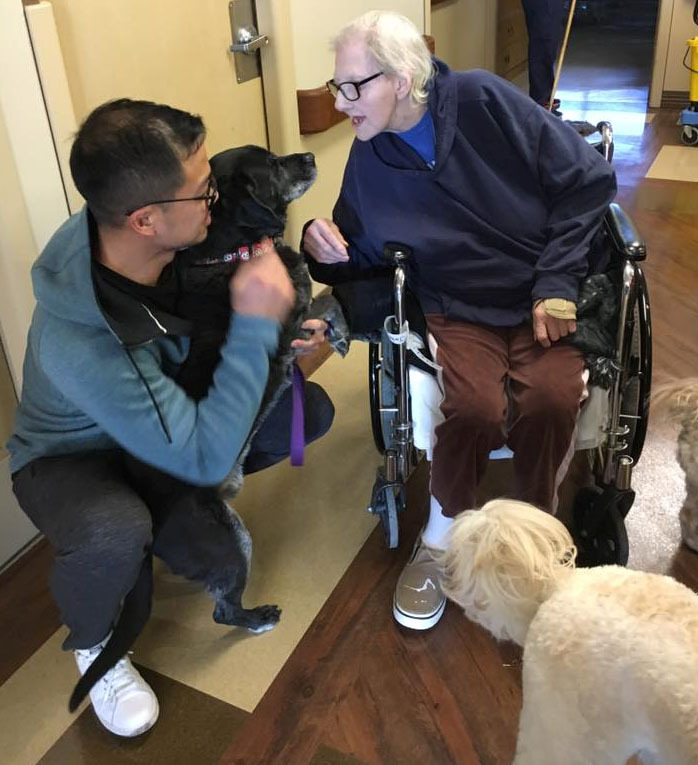 Perfectly Posh Paws will be doing Community Reach Out programs to comfort residents at Rehabilitation Centers and Retirement Communities in the hopes to bring sunshine into the residents that are unable to have pets at their center. 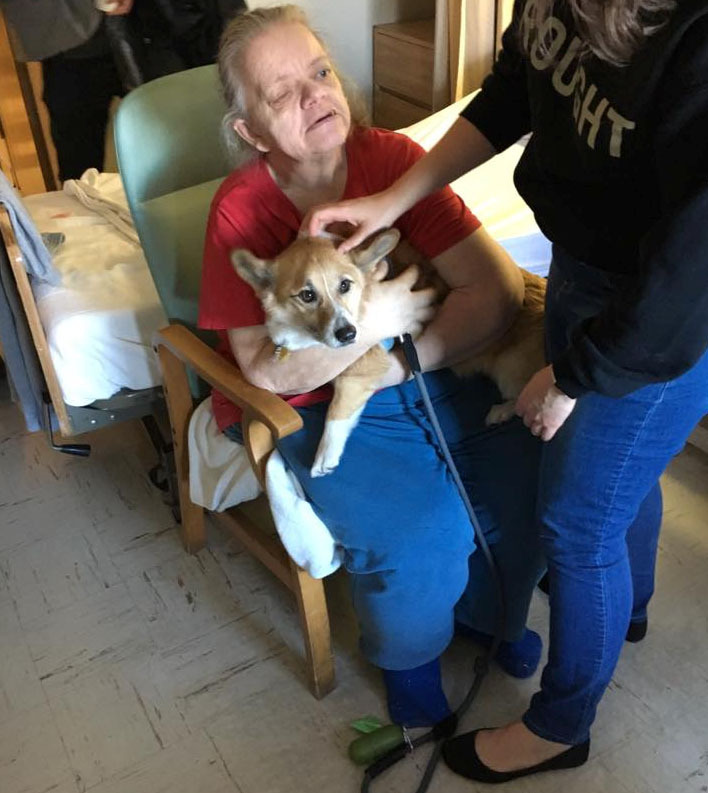 Many had pets when they were younger or when they lived in their own home, but either lost their pets or were unable to bring them to their Rehab Center. We are able to cheer them up and reminisce about times past. 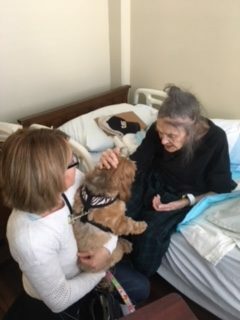 We are here to educate and improve the lives of the older community and by bringing our rescue animals we are able to show them that people care and in turn bring a smile to their faces. We will be posting our first outreach. These pictures were taken at an outreach event that our founder Linda attended with Alive Rescue. We are excited to be part of such an important outreach event. We will be having our own community outreach and hope to include outreach events at local schools and medical facilities. 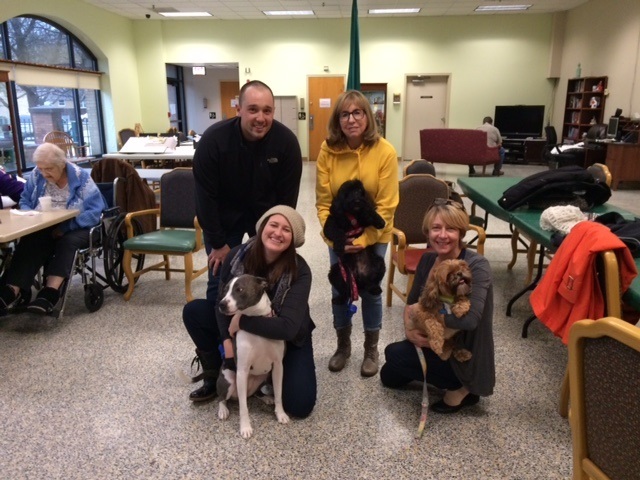 If you have NEW IDEAS on how we can bring our pets to your next event please contact Linda Atteo at 708.227.9337. Our pooches can be at your next birthday party, wedding or special occasion – please reach out to one of our team members at perfectlyposhpaws@gmail.com. We reach out to local community groups, schools of all ages (from pre-k, grammar, middle to high school and local college students), rehabilitation centers, medical facilities or retirement to talk about our rescues, our team, volunteering, fostering, adopting and the additional services we provide for dogs and cats in our care. We also speak to groups (upon request) to help educate the community about various topics and to expose the community to how great rescue dogs and cats are. We’ve want to go everywhere from schools to nursing homes. To learn more about our visits and these educational presentations, just sign up to have us speak to your group by calling our community leader Linda at 708.227.9337, and we can come to your facility and talk about caring for a pet and how love, affection, training and life-time commitment to your pets is our number one goal. 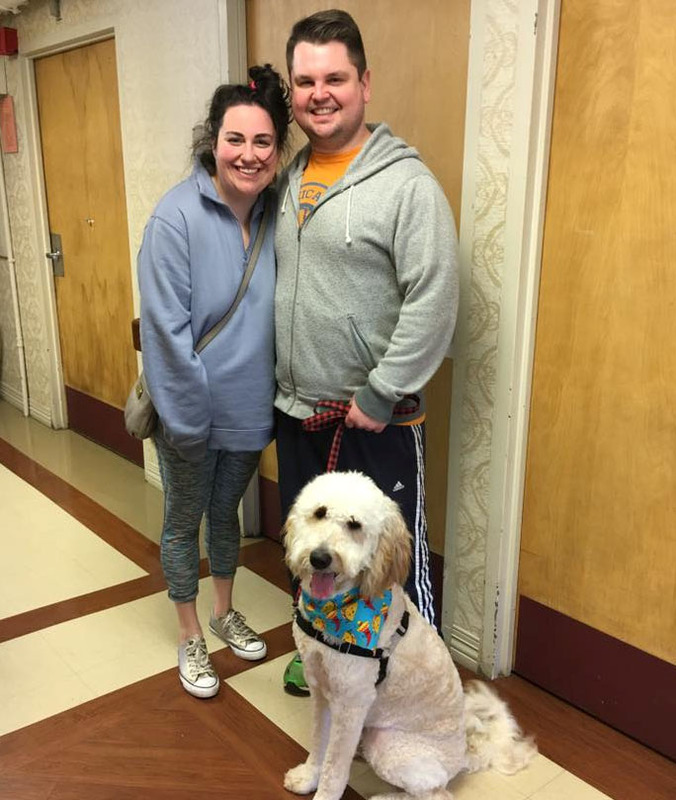 We offer pick-up and drop off service for your pet for routine checkups, drop offs for grooming or boarding or doggy-day care either one-way or round-trip service. We are here to help you with your pooch or feline so that you have peace of mind. We understand life gets busy and by offering this service to our adopters, you can feel rest assured that you’re pet will be cared for just like you would do for him/her. 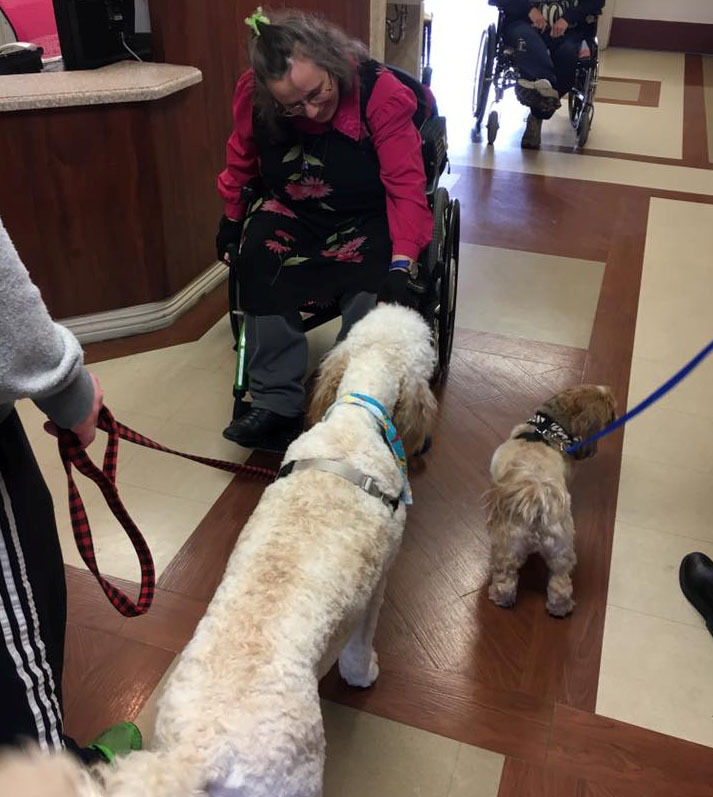 Here at Perfectly Posh Paws, we take every opportunity to educate the public of all ages, backgrounds and interests about the humane treatment of animals. We encourage community leaders to reach out to us so we can customize interesting attraction at any venue. 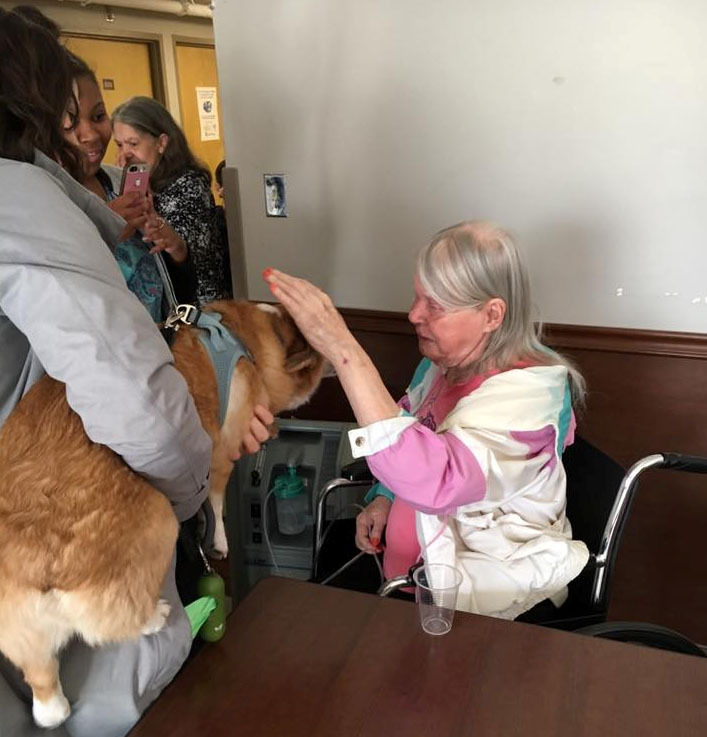 We can participated in health fairs, trade shows, festivals, cat shows, dogs shows and speaking engagements in a variety of settings for corporate, neighborhood and professional groups. Our approach can be tailored to the needs of your event! It doesn’t matter how large or small…we can offer your audience an interesting and informative event. We can bring an animal representative, our literature and events set up for sales of our reasonable-priced pet supply merchandise. 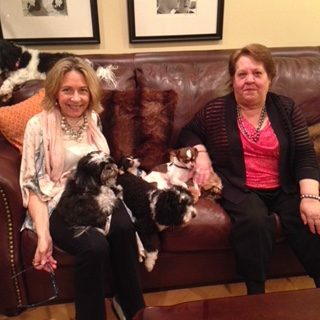 Contact our our Director Linda to custom tailor our participation in your event – bridal or baby showers, birthday parties, bar mitzvah, or milestone events we can bring our pups. We are happy to go where our community goes –whether it’s a restaurant, shopping mall, golf course, nail salon or at your church. We want everyone to meet our rescues in action, so they can show everyone how special they are. And we know once you meet them, you will fall in love. This is their time to shine and show the community they are the perfect pet. 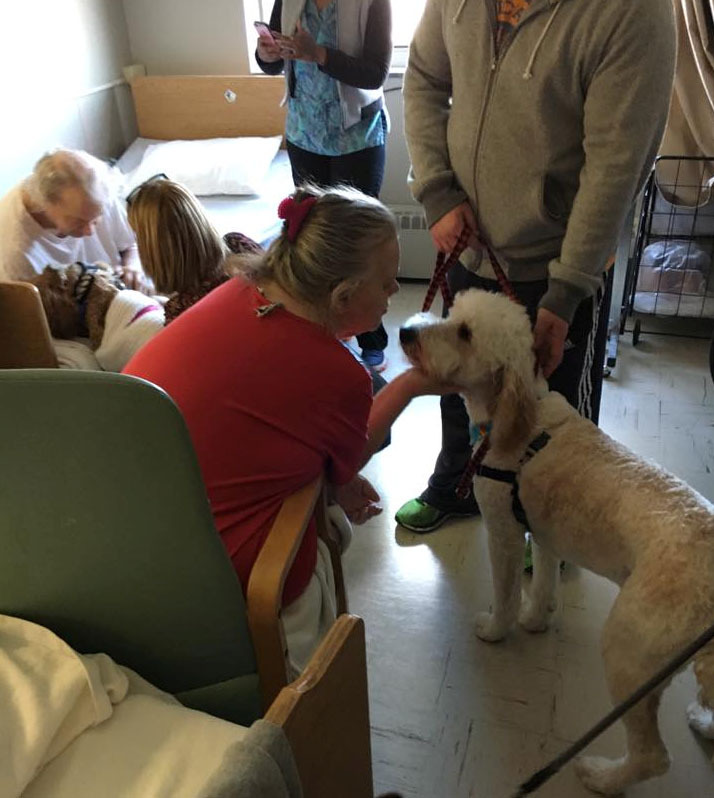 We encourage our community to play with our furry friends and ask questions. We enjoy seeing all the happy faces at our events. We will post on our site, when our next neighborhood meet/greet event will be. Or just call our neighborhood support line at 708-227-9337. Perfectly Posh Paws will partner with other animal shelters, rescues, advocacy groups, policy makers and families to save homeless pets and thereby creating a more compassionate educate community. We can’t do it alone if we want to end pet homelessness and if we’re going to save more lives we all need to do this together and stop the killing in shelters all over the world. We will create lifesaving initiatives that will further our cause and mission. From helping community cats that are forgotten to understanding pit bulls and educating on puppy mill dogs to advocating for better laws to protect them. We want to encourage adopting from shelters and not buying from pet stores. We want to maintain a holistic approach with complete transparency so our community can help our rescue build a strong foundation with respect, compassion and value. We are open to hear people’s viewpoint and we look for low-cost spay and neuter, reduced vet services and we will network with partners all over the world to help assist in our efforts and to receive fundraising for our mission. We will travel to whatever we need to receive expert resources and advice including visiting other successful rescues to mimic their programs and outreach events. We know shelter animal’s count and approximately 2.7 million dogs and cats are killed every year due to space and there aren’t enough adoptive and foster homes available. We all need to get involved and volunteer, even if you volunteered one hour of your time, would make an impact on shelter life for dogs and cats. There is a global movement called DoSomething.org for people who want to make a positive change, either online or offline. You can take immediate action. Only 1 out of every 10 dogs born will find a forever home. The main reason animals are in shelters are from owner surrenders or animals living on the street from either abandonment or neglect. Each year, approximately 2.7 million dogs and cats are killed every year because shelters are too full. There are low adoptions and foster families which creates a ripple effect in the shelters. Euthanasia is high for this very reason; it could be afforded if people thought differently about adopting through shelters and at animal control. Education is key on changing peoples perceptive. Approximately 7.6 million companion animals enter animal shelters nationwide every year. Of those, approximately 3.9 million are dogs and 3.4 are cats. It’s impossible to determine how many stray dogs and cars live in the United States. Estimates for cats alone range up to 70 million. Only 10% of the animals received by shelters have been spayed and neutered. Overpopulation, due to owners letting their pets accidentally or intentionally reproduce, sees millions of these “excess” animals killed annually. Do you have a special talent, skill or trade? If so, we want to hear from you. Is designed with you in mind. If you have a passion for animals. Our volunteers can help sign you up. We need drivers, vet techs, animal lovers and people who enjoy working with animals. Provides a platform for people to share their special gift. It helps us to expand our educational outreach programs, improve our rescue and save more lives. You can design your own way to help our furry friends and our youngest fur babies. We understand people can’t always volunteer, foster or adopt. Sometimes money is tight or your life is busy with work and family. But, did you know that by sharing your talent you are helping the animals in a very big way. Support our mission, our animals, our programs, and our team. We appreciate anything you can do to help us. 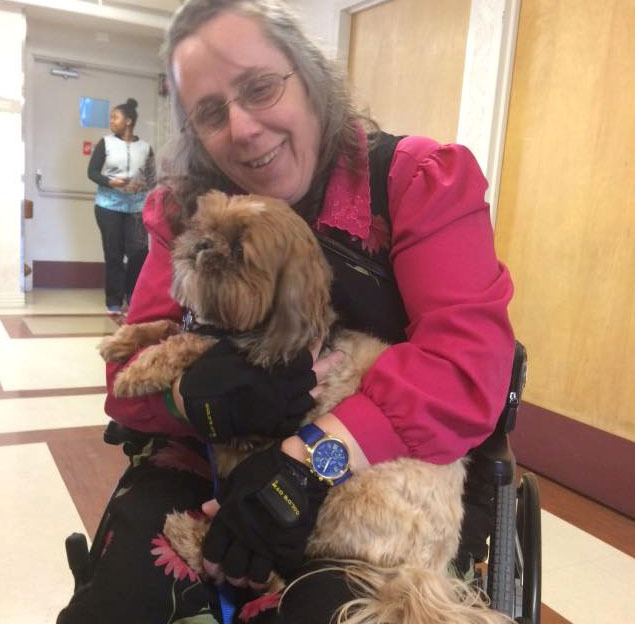 You can help from cuddling a cat to walking a dog or by teaching our pets obedience. Our rescue can add more educational programs and help more animals in need. We are always looking for volunteers to help with outreach, events, fostering, and animal care! There are many programs and jobs that we need assistance with. In which you can get involved with Perfectly Posh Paws, if you have any other passions you wish to contribute to our rescue just let us know! We need animal care takers, veterinary assistants, pet groomers, dog handler, grant writer, veterinary nurse, veterinary dentist, animal control worker, cat behaviorist, animal nutritionist, pet adoption counselor or animal acupuncturist. By cuddling with our animals, provide short-term home stays, offering temporary take-in relief. Or by using your talent, volunteering, fostering or adding your trade, skill or talent you can make a difference in the lives of our furry friends. Help us grow so we get better. Help us improve our mission and our rescue. We need more people to assist in our daily tasks, administrative work, copy editing, newsletter writer, answering the phone, partner outreach, bringing our pups to vet appointments or just help us get the word out. If you have a special way to support us, we would love to hear from you. But we can’t do it alone. We need the community, our neighbors, our family and our friends to make a difference. Take the step now and join our Posh Pink team. Expand your talents and help us with pet events, silent auctions, sponsorships, partner growth program, adoptions, fostering, party with us program or community outreach. 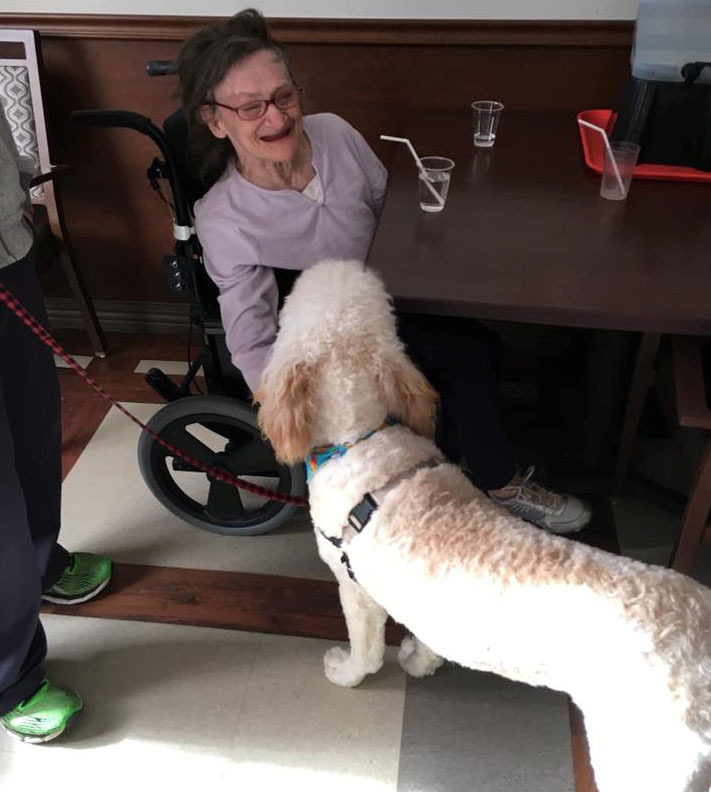 You can help us by visiting nursing homes and rehabilitation centers. Surround our furry pals with love, just visit them or offer better ways we can help our pups, kitties or small animals. Each day our furry friends are with us, we want them to feel a part of a family. Bring them with you for a special day in the park or take a walk with one of our special needs animal. You can sit with them, hold them, read to them or just talk to them. You can hug them, socialize them, drop off treats for them or just get to know them. You can stop by one day a week or one day a month. For every moment you spend with our animals in return they will love you unconditionally. Tell us what you’re passionate about. Share your talent, skills and trade. Help us work to spread the word about rescue, animal testing, puppy mills and dog fighting. What is your most inspiring animal story? We want to hear from you. Help us improve our program, rescue and mission. is looking to expand and grow. But, we need your help and we can’t do it alone. You can make a difference in an animal’s life. We are calling on our community and people like you. Call our Pink Posh Coordinator Linda 708/227-9337, for any questions, comments or suggestions you may have. To sign up to volunteer please fill out the contact form at the bottom of this page. All volunteers are required to fill out a form, available below. Get Started with Kindness! Let’s begin your journey today!